A driver in a small car follows three snow plows down a major road in Greensboro, N.C., Dec. 9, 2018. Accidents on snow-covered interstates caused major delays on Sunday, hundreds of flights were canceled and drivers in North Carolina and Virginia got stuck in snow or lost control on icy patches. But the commuters' nightmare provided pre-winter thrills for kids and the young at heart, who were able to go sledding and build snowmen in places that don't often see so much of the white stuff. A snow-covered car is parked outside a home in Greensboro, North Carolina, Dec. 9, 2018. A massive storm brought snow, sleet, and freezing rain across a wide swath of the South on Sunday. The National Weather Service said a "prolonged period of snow" began late Saturday and would last until Monday in the region, with the heaviest snow in northwest North Carolina and southern Virginia. 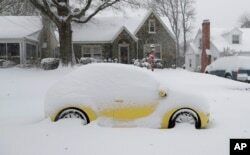 Some areas of North Carolina and Virginia saw more than a foot (30 centimeters) of snow by Sunday afternoon. Russ Sprinkel removes snow from his vehicle on Washington Avenue in Roanoke, Va. as snow continues to fall throughout Southwest Virginia, Sunday, Dec. 9, 2018. "Stay put if you can," Cooper said Sunday. "Wrap a few presents, decorate the tree, watch some football."